Standard definition TV (SDTV), by comparison, may use one of several different formats taking the form of various aspect ratios depending on the technology used in the country of broadcast. 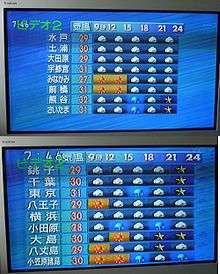 For 4:3 aspect-ratio broadcasts, the 640 × 480 format is used in NTSC countries, while 720 × 576 is used in PAL countries. For 16:9 broadcasts, the 720 × 480 format is used in NTSC countries, while 1024 × 576 is used in PAL countries. However, broadcasters may choose to reduce these resolutions to reduce bit rate (e.g., many DVB-T channels in the United Kingdom use a horizontal resolution of 544 or 704 pixels per line). While poor signal quality on an analog TV is still viewable by the user, digital TV is less forgiving. When noise is introduced analog TV can be either annoying or not even perceptible, while digital TV will experience either annoying tiling or no picture at all. ↑ "picturephoning.com: DMB". Textually.org. Retrieved 2010-06-17. ↑ "South Korea : Social Media 답변 내용 : 악어새 - 리포트월드". Reportworld.co.kr. Retrieved 2010-06-17. ↑ "Lead in Cathode Ray Tubes (CRTs) Information Sheet**" (PDF). Electronic Industries Alliance. 2001-11-30. p. 1. Retrieved 2009-09-29.